The 24-Hour Mommy: Looking for a graduation dress? Looking for a graduation dress? Graduation month is fast approaching. My youngest brother is graduating in college and, since he's a guy, I won't need to worry about his attire. The only thing that we will need to have is the almost 7k in graduation fees that I need to produce by the end of this week. Oh well, at least the next thing that I need to save up on is his graduation dinner and I still have lots of time for that. Girls have greater graduation woes. Not only do they have to pay the graduation fees but they also need to look pretty come graduation day. In my high school, we were only required to wear our school uniform underneath our white togas. Graduating from UP Manila, I didn't get to wear a sablay as the UP Diliman graduates did. What we wore was a black toga and underneath it I wore my mom's pretty powder blue coat and skirt. Good thing we're both of the same size! 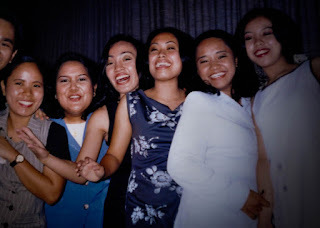 Me with my college barkada. Times are tough and graduation fees are already expensive. A borrowed cocktail dress can be a pretty graduation dress. Old bridesmaid dresses can also be re-used. Graduating from college is indeed a once in a lifetime affair. Then again, I don't think that we should spend so much on graduation dresses.